So the waffle vs. pancake debate reared its ugly head this weekend. I wanted pancakes and the rest of the people living in my house decide that only waffles would do. After spending 15 minutes trying to find the waffle maker that was last used when Reagan was in office I proceeded to make a breakfast that was so awesome that I couldn’t figure out why it took me so long to rediscover waffles. I like to say that waffles are pancakes on steroids (actually they usually contain more fat than pancakes which makes them crisper). They consist of a batter made from flour, eggs, sugar, butter, milk and baking powder. They are created in a waffle iron that can be of just about any shape or size. Both sides of a waffle are cooked simultaneously and at their best, are crunchy golden brown on the outside and light and fluffy on the inside. Waffles and pancakes are technically both quick breads and while the boxed brands or Bisquick will do in a pinch I suggest you make them from scratch. While some waffle recipes want you to separate the yolk from the white, then whip up the whites then fold them in, unless you’re making fancy stuff for company you don’t need to take this extra step. Yes is will make them a bit lighter but in the end you’ll be eating them so fast you won’t be able to tell the difference. Before we get to the recipes I wanted to let you know that I have several foodie friends who have taken their waffle making to new heights by cooking other kinds of foods in the waffle maker. The following, in no particular order are some of the more interesting (and delicious sounding) treats you may want to try once you finish making waffles. 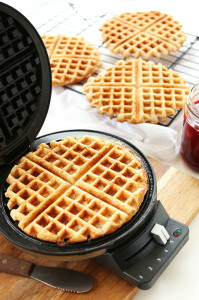 Corn bread: use your favorite recipe; just spray the waffle iron very well before cooking. Hash Browns- spray waffle iron REALLY well then cover the bottom with tater tots, the press the lid down very firmly. , Open it quickly to check if there are any empty spots; add more tater tots to cover the entire bottom. Put the lid back on and cook until crispy. Mac & Cheese- Make your recipe. Cool it and press it into a square pan and refrigerate it for at least 1 hour (I only make this with left over Mac & cheese) Cut the Mac & cheese into square then dip the square in flour then dip in a beaten egg then dip the square in panko bread crumbs, and then cook on a well greased waffle iron. Note: Yes you can use your favorite pancake recipe for waffles but they won’t be quite as crispy or fluffy a traditional waffle.